INTRODUCTION: Throughout the world, the majority of colonoscopy is performed by Gastroenterologists. In our hospital, however, the general surgeons have been the principal exponents of all upper and lower GI endoscopy for over 20 years. The current interest in Natural Orifice Transluminal Endoscopic Surgery (NOTES) necessitates more general and laparoscopic surgeons become skilled at gastrointestinal endoscopy. Colonoscopy is technically difficult and requires skill not easy to acquire. Prior to this study, the quality and safety of endoscopies performed by the General Surgeons in our hospital has been neither retrospectively nor prospectively assessed. AIM: To evaluate the safety and quality of diagnostic and therapeutic colonoscopies performed by the General Surgeons in our department, and compare the results with those of specialist Gastroenterology units. We aim to recruit 2000 cases. METHOD AND METERIALS: On 1st September 2007 a prospective study was initiated to evaluate colonoscopy completion rates, reason for failure, time taken to complete colonoscopy and any complications. All patients undergoing colonoscopy, both elective and emergency, were included. All relevant data were entered into a prospective data sheet. RESULTS: We present our initial results of first 800 patients. 419 (52.4%) cases were performed by the consultant and 381 (47.6%) by the trainees. The average time taken to complete colonoscopy was 19.4 minutes. Caecal intubation failed in 85 (10.6%) patients. The crude completion rate was 89.4% and the adjusted rate 95.2% (excluding incompleteness due to poor bowel preparation and stenosis). 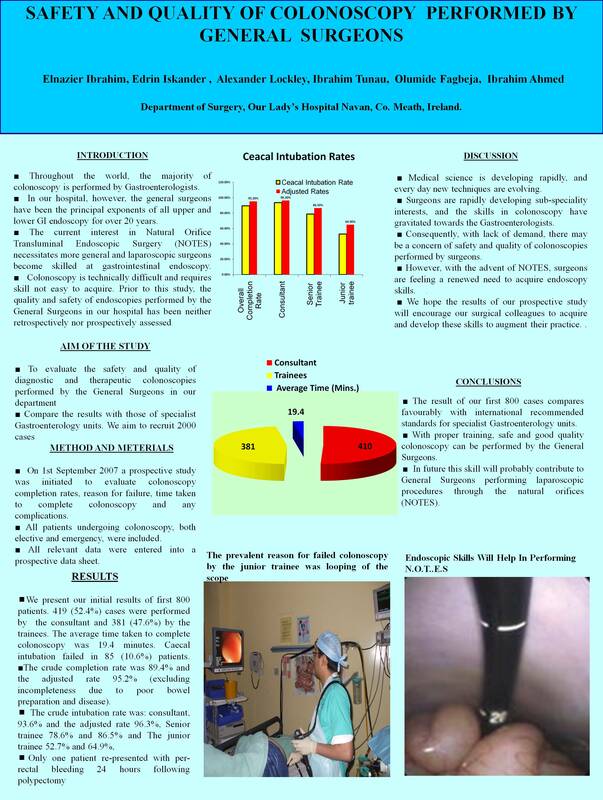 For the consultant, the crude intubation rate was 93.6% and the adjusted rate 96.3%. For the senior trainee the corresponding figures were78.6% and 86.5%. The junior trainee, however, achieved a success rate of only 52.7% and 64.9%, and needed senior help to complete caecal intubation in the majority of the remaining patients. The prevalent reason for failed colonoscopy by the junior trainee was looping of the scope. All failed cases were evaluated further with either Barium Enema or C.T colonography. Only one patient re-presented with per-rectal bleeding 24 hours following polypectomy. He underwent repeat emergency colonoscopy, performed by the same surgeon, with haemostasis achieved endoscopically. There were no other complications. DISCUSSION: Medical science is developing rapidly, and every day new techniques are evolving. Surgeons are rapidly developing sub-speciality interests, and the skills in colonoscopy have gravitated towards the Gastroenterologists. Consequently, with lack of exposure, there may be a concern of safety and quality of colonoscopies performed by surgeons. However, with the advent of NOTES, surgeons are feeling a renewed need to acquire endoscopy skills. We hope the results of our prospective study will encourage our surgical colleagues to acquire and develop these skills to augment their practice. CONCLUSION: The result of our first 800 cases compares favourably with international recommended standards for specialist Gastroenterology units. We believe with proper training, safe and good quality colonoscopy can be performed by the General Surgeons. In future this skill will probably contribute to General Surgeons performing laparoscopic procedures through the natural orifices (NOTES).